Die Casting Terms Glossary | The Basic Aluminum Casting Co. Die Casting: The process of injecting a molten metal alloy into a die cast die to form a die cast part, or die casting. Die Casting Die: A tool specifically designed for use in the die casting process. A die casting die consists of two halves, an ejector or moving half and a cover or stationary half. The die is typically constructed using multiple steel alloys, depending on where the component fits in the die. The die cast process has significant thermal stresses due to the cycling of hot metal across the face of the tool. Aluminum alloys also aggressively attack the die steel chemically, causing wear. Due to these issues, the cavity section of the tool is made from a premium steel alloy, such as H-13 to stand up to these stresses. 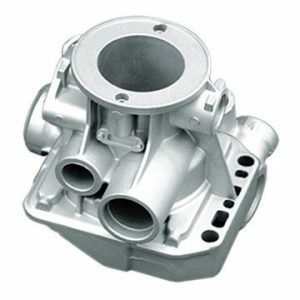 A die casting die has many components to allow it to perform its function. The ejector pins and plate are used to push the solidified part out of the die. Slide cores are used to form internal passageways or additional geometry on the exterior of the part. Core pins are used to create holes in the die casting at precision sizes and locations. Water lines are critical to cool the liquid metal in an even manner. All dies must be designed to fit the specific die casting machine they are going to be used in. Die Casting Alloy: An alloy used to make die castings. Basic utilizes aluminum alloys to fit the customer’s end need, such as 380 or 383. Different alloys have varying strength, fill and wear characteristics, depending on their chemical composition. Die Casting Machine: A large hydraulic press which closes the die, injects metal into the die, opens the die and then ejects the die casting. Die casting machines are sized by their closing tonnage. The higher the closing tonnage, the larger the die casting that can be made in that particular machine. This is a function of the projected area of the die casting. Die casting machines with higher closing tonnages are larger, have greater opening strokes and are capable of injecting larger volumes of molten metal. Due to the larger cylinders and volumes required to do this, larger machines cycle slower than small machines. Die casting machine cycle time is also impacted by part geometry where thicker sections require more time to solidify. Die Cast Injection: The act of forcing molten metal into a die casting die. Basic utilizes cold chamber machines where the molten metal is poured into a shot sleeve. A plunger tip then pushes the aluminum into the die. This is done in several speed phases. A slow phase is used to cover the shot sleeve hole and fill the sleeve and runner system. A fast phase is used to inject aluminum into the die cast die cavity at a rate that properly fills the part geometry. After the cavity is filled, the shot cylinder is taken to a higher pressure to squeeze the casting during solidification (intensification phase). Trim Die: When a die casting is made, additional material exists on the part along the parting lines of the die. It is necessary to die trim the casting to remove the runners, gates, overflows, vents and flash along the periphery of the part to bring the die casting into size tolerances along these edges. Finishing: Refers to processes performed on the die casting after the trim process. Many different processes may be performed on the casting to meet the customer’s product needs. These include shot blasting, painting, machining, thread tapping and many more. See Basic’s web page on our capabilities. In addition, many die castings can have additional components assembled onto or into them and delivered to the customer as a functional mechanism of a larger system or product. Dimensional Tolerance: A die casting is capable holding precise tolerances, which is one of the advantages of the die casting process. Depending on the component and dimension, these tolerances can be +/- 0.1mm or less. Precise tolerance requirements for the casting should be identified before tool design to ensure that the tool is designed to meet requirements. See the North American Die Casting Association (or NADCA) for specific tolerancing guidelines. Defects: May refer to a number of typical die casting failure modes including warping, blisters, cold shuts, porosity, solder and lamination. Failure mode type is often a function of the part geometry and requirements. Thin walled parts are more susceptible to cold shuts than heavier sections which typically are prone to porosity. In the planning process, the die casting company must evaluate the part and design the production process to prevent these failure modes. Draft: This refers to the angle of walls, cores and other features in the part along the direction of die pull. In order for a casting to be removed from a die cast die, it must have positive draft along any side walls so that it can release from the die steel. Negative draft, or undercuts, will cause the part to hang on the die or be damaged upon removal. Print: The part print is a critical input into the manufacture of die castings. Part prints identify feature tolerances and critical characteristics which are important to the function of the die casting. Prints also have required information about alloys, revision levels, finishing operations, trim requirements, etc. needed to define a functional casting.